The Special Olympics Illinois State Bowling Tournament was still a day away but Special Olympics bowlers Maegan Walton and Vince Mertes were already being treated as champions as they marched through the halls of LaSalle-Peru Township High School. As part of the LP State Send-Off, Walton and Mertes, like all LP students who make it to a state-level competition, were paraded through the school with the drum line trailing behind them and the rest of the high school’s students, faculty and staff cheering as they marched through the building. View video of the Send-Off. Vince Mertes (left) and Maegan Walton receive a State Send-Off at LaSalle-Peru Township High School before the Special Olympics Illinois State Bowling Tournament. Walton of Granville went on to win a gold medal in the competition. Mertes of Peru earned a fourth-place ribbon. The LP State Send-Off is a new tradition at LP High School. So far this year the school has seen members of its girls tennis, girls cross country and volleyball teams, along with the Special Olympics bowlers, honored in this fashion. LP High School currently participates in Special Olympics Project UNIFY. 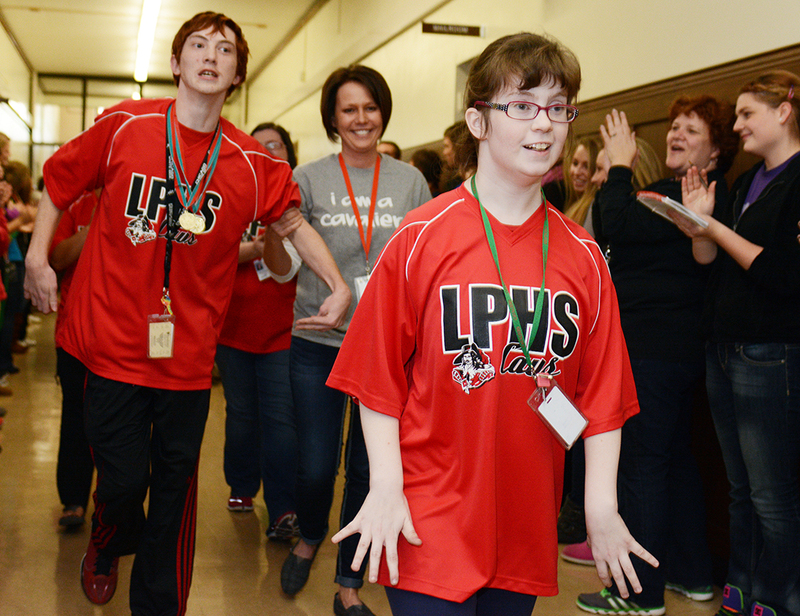 Activities, such as this State Send-Off, only highlight the many great things being done to ensure that all LP students, regardless of ability, are treated with dignity and respect. “We believe very strongly that our vision statement, ‘Learn…Grow…Lead…Excellence is our Standard!,’ applies to every student in our district,” Superintendent Steve Wrobleski said. Jayme Salazar, an LP special education teacher, echoed Wrobleski’s sentiments. “LPHS has always done a good job of including students with disabilities in the school, however this is our first year participating in Project UNIFY and our objective is to improve the school climate to foster respect and acceptance. The encouragement the students received through the State Send-off was a true symbol of respect for all people at LPHS. Maegan and Vince will remember this moment for a lifetime but it was just as significant moment for all LPHS stakeholders, as it set the standard for our school climate,” she said.